The following are categories of honours which involve the Society. The Society's Honours Board is mounted in the Town Hall by kind permission of the Town Council. 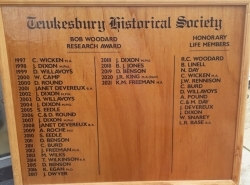 Named after the late Bob Woodard, Honorary Life member, it is awarded each year for an article published in the annual Bulletin of the Society which is deemed by independent judges to have contributed significantly, by the quality of its research and the clarity of itscommunication, to increasing the knowledge of the history of Tewkesbury and District. The award is a silver bowl with the names of winners inscribed upon it and a medal for the winner to keep.The independent judges, who report to the AGM, have been David Aldred, local author & Head of History at Cleeve School, Nicholas Kingsley, County Archivist, John Loosley, Chairman of the Gloucestershire Community Council for History & David Evans, Author, Academic and Broadcaster. John Loosley has now retired and has been be replaced by Dr. Steven Blake. 2017 Judy Dwyer 'Notorious Highwayman of Tewkesbury'! 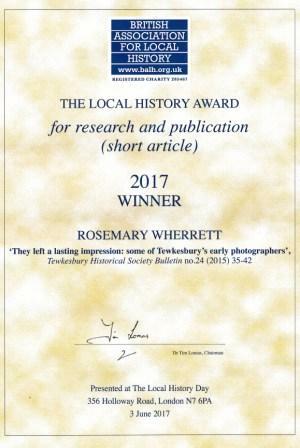 Since 2003 the Gloucestershire Rural Community Council Local History Committee annually awards a prize to the author of the best article published during the year on any aspect of local history in Gloucestershire. Bryan Jerrard was the former Chairman of the Committee, he offered great practical advice and encouragement when THS was set up in 1991. The judges look for interesting topics, organised material and footnotes (endnotes), and bibliography where appropriate; use of illustration, maps and plans, and a variety of sources with awareness of their reliability, together with how they relate to the regional and national context. The winner must demonstrate the connection between a local topic and its national context. As you can read in his obituary, the late Colin Wicken was the founding Editor of the Society’s Bulletin. He was also a teacher of many years’ standing and was immensely concerned to encourage young students to research and write articles for the Bulletin. One of the reasons why the Society was founded in 1991 was the collaboration between the Library, the Museum and Tewkesbury School which, at that time, offered a GCE Local History Course for Lower Sixth Form students. It was the outstanding article by Cameron Lawrence which inspired the Colin Wicken Bursarywhich was awarded retrospectively. That course itself passed into history but in 1996 the school embarked upon a new A Level syllabus that required the writing of a 6,000 word assignment. The Colin Wicken Bursary – an award of £25 – was subsequently awarded to the writer of a Local History Assignment which was worthy of publication in the annual Bulletin. Education change has once again intervened and the requirement to write a substantial assignment has been reduced. In recent years no assignment on local history has been submitted to our great disappointment. Thus there has been no award made.